Thank you in advance for helping to serve those in our community who are in need during this time in their lives! Take a little time and read through the opportunity list below and choose how many items you’d like to sponsor! 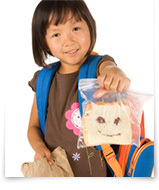 Backpack Bag – A “refill” of food for kids to take home in order to have healthy food over the weekend. Many of our students do not eat well or at all over the weekends when the kids do not have access to school breakfast and lunch programs. A typical bag contains 2 cereal bowls, granola bar, peanut butter, fruit cup, cheese and crackers, nuts and dried fruits. Your donation provides a child with healthy snacks for 1 year. Weekly Brown Bag – A grocery bag filled with fresh produce, seasonal fruits, breads, canned goods and dry goods delivered to our senior and homebound neighbors. Your donation provides bags for 2 weeks. 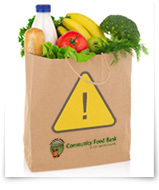 Emergency Food Package – Many times we see people in desperate need of nutrition come into the Food Bank. We provide an emergency bag filled with fresh produce, seasonal fruits, breads, canned goods and dry goods, plus eggs, dairy and/or meat. Your donation provides 1 package. Looking to give more? Place multiple items in your Virtual Donation Box until you reach the level you want to donate. Looking for another way to give? See our Give Help page.